Stress due to work or home life? Getting type 2 Diabetes, osteoarthritis, obesity or heart disease? Getting older losing your memory? Believe it or not, your Dr. could have the same prescription for all of the above scenarios. 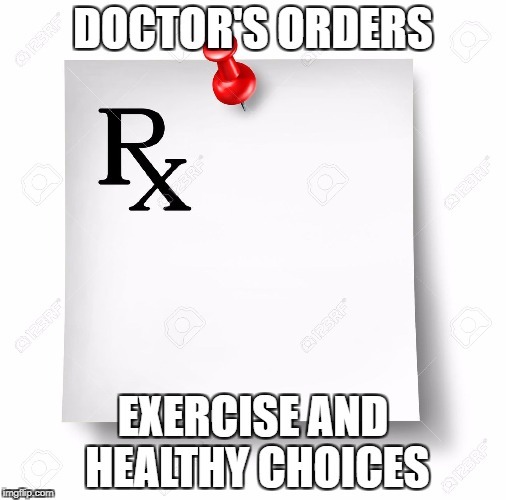 To your surprise, the prescription is EXERCISE and HEALTHY CHOICES! In a perfect world, your doctor would not reach for the list of pills and potions that are designed to “cure” all that ails, but instead writes a prescription for 150 minutes of moderate aerobic activity (which is the recommendation from the Department of Health and Human Services) and a low processed diet filled with fruits, vegetables, healthy fats, protein and carbohydrates. Would you be jumping up and down that you don’t need to take medication or slightly panicked because that prescription is not easy to fill. You are now left wondering how to add exercise into your life and make all those healthy diet changes as well. Many Dr.’s have a tendency to leave that part out. Actually, many leave all of it out, (the “prescription for exercise and a healthy diet) and the harder part of how to implement it all. Exercise and a healthy diet can cure a lot with only positive side effects. With any luck, this will become part of the prescription of the future for all of us. If you are fortunate enough to have that prescription, (as opposed to meds) but don’t know where to start, think about identifying one small change at a time that will begin to help you with your health and wellness goals. It is not realistic to be sedentary and then implement 150 minutes per week of exercise or a diet that is filled with overly processed foods and unhealthy fats to clean eating tomorrow. Think about one change at a time. Keep it simple, but start to move and follow your Dr.’s orders! (Optional) Walk to Hotel Indigo for After-Dinner Drinks, Socializing & Fun! Lunch and Learn, How to Eat Healthy Through the Holidays and More! Wednesday, November 8th at 6:30 -8:30pm! I will lead a discussion on how to eat healthy, make better choices while still enjoying yourself at your favorite restaurants and holiday parties. You will learn valuable skills that will be easy to share with your friends and family, and how to’s for creating a healthy relationship with food that will last a lifetime. We have reserved a private room in the back of the restaurant. Each person is responsible to pay for their own dinner. You can check out Margaritas’ menu here. First tip, look at the menu ahead of time and find a healthy choice! Are you separated, divorced, or in the process of divorce? Whatever stage you are in . . . just considering divorce or many years post divorce . . . our Divorce Resource Nights have something for you. • Speak one-on-one with caring and experienced professionals in the fields of divorce law, finance, real estate, parenting, nutrition, relationship coaching, therapy, fashion, fitness and more. • Hear professionals describe how they can best hel p you. • Enjoy complimentary light fare and refreshments. • Meet other attendees who are in various stages of divorce or separation. This is a joint event with other meetup groups. There is no charge for attendance, and discussions with professionals are kept confidential. To find out more about these and other social and informative events hosted by Vesta, please contact Deanna at 508-744-6014 or Team@VestaDivorce.com. Or visit Vesta’s website at VestaDivorce.com(http://vestadivorce.com/).